Disney used the Star Wars Celebration in Chicago to give us the first teaser trailer for Episode IX and within unveiled the title – RISE OF THE SKYLWALKER. This is a real disappointment to be honest and clearly a marketing concession in the attempt to get the fans back that are pissed by Rian Johnson killing off Luke Skywalker in THE LAST JEDI, like it already was to communicate Mark Hamill would be back as well as Billy Dee Williams. Normally, you would try to surprise fans with this, but Disney definitely know they have some problems and they need to fix it. Disney is scared and that might be a problem. My fear is, J.J. Abrams was not able to tell the story he’d like to tell, but forced to include certain elements to conciliate the alienated fans, but let’s see. The trailer starts with what might be the final confrontation between Ray and Kylo Ren, most likely back on Jakku. 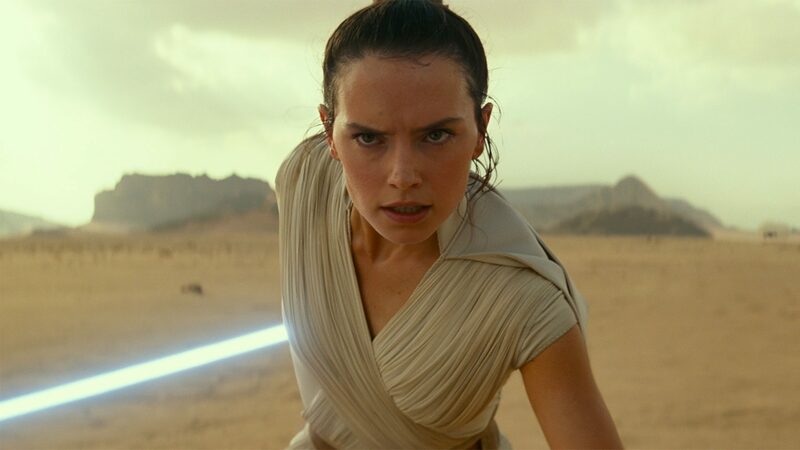 With the title Rise of the Skywalker, I’m back to my theory I already formulated directly after THE FORCE AWAKENS – Ray is Ben’s sister, the outcasted daughter of Leia and Han. Pushed away when Ben was seduced by Snoke, so she would not get a victim of him as well. This would mean that Ben lied about her parentage. What Luke says from the off, that they would always be with her, the tears when she hugs Leia, all of this are strong indicators to me that I’m right. The teaser does not give away too much, a few glimpses at some of the planets, one looks like Eadu and of course a first look at Billy Dee Williams back as Lando (I’m curious why and how he is back in the game and if we learn what he did all these years) but nothing about Luke, besides his comments from the off. The end is then what makes this teaser really interesting, Ray and her friends are visiting the crash side of the remains of the second Death Star, most likely on Endor, shortly before we hear the all familiar laughter of Papaltine – so will he be back? How is he connected to all of this and will we ever learn who Sknoke is or was? There is also the rumor that Vader will be back – but this rumor is tied to every episode of course. I’m interested, but I’m not blown away to be honest. Episode VIII left a lot of questions marks and a bitter feeling somehow. So I’m skeptical, but I do hope Abrams finds a good, interesting ending for the saga that does feel natural and not too artificial or that they tried too hard. If I’m right, the Skywalker that rises is Ray and not Luke. But there is another option of course, which would be that Luke becomes the first Jedi ever coming back from the force – but to do what and why?